Our new clubhouse is open to the public seven days a week from 7 AM to 7 PM, with additional scheduled private evening events. The clubhouse features the Pro Shop and The 1908 Bar and Grill. It was designed by Mr. Stephen Stojcich of Eley Guild Hardy Architects and constructed by Mr. Garlon Pemberton of Garlon Homes. 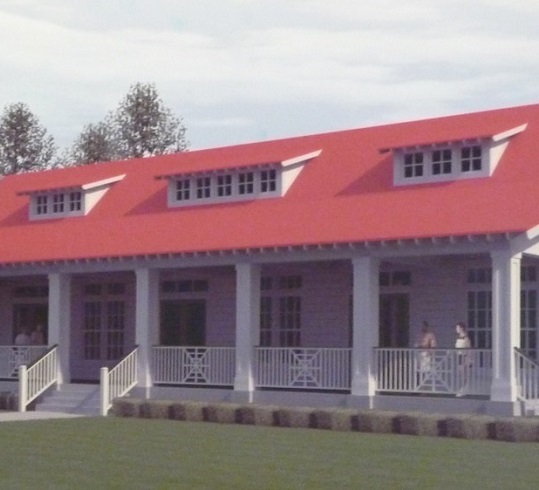 The clubhouse is entirely modern but captures the key themes of our historic clubhouse that was lost to Hurricane Katrina in 2005 including the roof gables, red roof, large windows, and Acadian-style porch. This 4,800 square-foot facility includes a Pro Shop, The 1908 Bar and Grill, dining room, multi-purpose room (meetings, events, private dinners, etc. ), and a full-service commercial kitchen. Pro Shop offers a wide range of golfing products and services to meet the needs of our members and guests. Our food and beverage operations are directed by Ms. Tiffanie Frasier. Our highly trained and friendly staff are dedicated to making your experience at the Great Southern a truly great one! The Great Southern Golf Club is a perfect site for your tournament! Our new clubhouse provides a perfect place to enjoy your 19th- hole activities, a great meal, a catered event, or just a drink or meal while seated inside or on the covered 80-foot porch with spectacular views of the Mississippi Sound and Gulf of Mexico. Our facility is approved for up to 99 people inside and an additional 24 on the covered porch. This capacity makes our site ideal for your dinner party, stand up or seated buffet, rehearsal dinner reception, or similar-sized event. We can arrange tentage for larger events that can be held anywhere on our 129 acres. We have several areas that are dramatically surrounded by copses of historic oaks and spectacular viewss for outside events. Imagine a wedding gazebo and reception tent near the frontage road overlooking the Gulf; or a wedding under the majestic oaks out on the course (you get there via our new golf carts!). We also offer a private dining room that can seat 24. From an elegant dinner, to a bridge party, to a football party, we can put a package together to meet your needs. We welcome business and social groups to use our private dining room at no reservation fee. You get a dedicated server/bartender and discounted prices on food and beverages . This facility was built for entertainment with seven TVs, built in hardline internet and wireless connections, infinite audio and visual options for your entertainment, and a remarkable selection of food and drink at great prices. We build the package around what you want, not just what we have on hand. Want something special? Just ask, our aim is to please you. Our bar has 14 bar stools and can quickly serve even a large thirsty group very quickly. No long waits at the Great Southern bar. The 1908 Bar and Grill is open to the public seven days a week, 7:00 AM to 7 PM! Most importantly our service and quality of food and beverages are superb. Tiffanie Frasier is experienced in all facets of special event planning. She and her highly-trained staff can help you plan and execute your events with great success. Our kitchen staff can prepare almost any menu and beautifully serve it, whether you are hosting a seated dinner or a stand-up reception. Our price packages are tailored to your event and we will beat the competition. Our building is smoke-free, however we do have designated smoking areas outside. The facility is open to the general public. Stockholders and club members enjoy additional benefits and discounts. Book your 2017 wedding reception, party, or business meeting with us. Call Tiffanie at 228-284-2237 to make your reservations today.